Using a poorly fitted or incorrect bag for school may cause children to experience fatigue, muscle strain, back pain, distortion of the spine’s natural curves, rounding of the shoulder and neck pain. 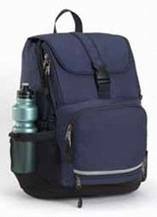 Most children now use a Back Pack rather than a traditional school bag which is a great improvement because when worn correctly the load is distributed evenly across both shoulders. But what more will help? When the weight of what is being carried is further away from the spine the load and strain on the spine is greater. Keeping the load close to the spine is safer. Split main compartment allows you to pack the heaviest items near the spine. Compression straps also bring the load in closer to the spine. A Contoured and well fitted back panel worn high up on the back so it is above the hips will also allow the backpack to sit in snugly against the spine. Internal compartments or a split main compartment to allow you to pack the heaviest items closest to the spine. Compression Straps to bring the bulk of the bag in as close to the back as possible. Well padded shoulder straps that are comfortable and sit well on the shoulder. Waist and chest straps waist belts help transfer some of the load to the hips and pelvis. Built in rigid and padded back support allows a snug fit high on the back. Back pack should be sized to fit each individual child. Don’t buy a big pack to “grow” into. Try not to carry greater than 10% of your body weight. Pack the heaviest items against the spine. Use the middle compartment for bulky pencil cases, lunch boxes, clothes, shoes etc. When the pack is loaded ensure all zips are closed and side compression straps are tightened to bring the bulk of the pack in as close a possible to the back. Wear both shoulder straps all the time. Wear the pack so the load is high. The top of the pack should sit level with the top of the shoulders. Waist belts should be tightened when walking greater distances or if the load is greater than 10% of the child’s body weight. Repack your bag each night and only carry what you need. To find out about the backpack that’s designed from research by physiotherapists at the University of South Australia and endorsed by the Australian Physiotherapy Association. The PhysioPak, visit www.physiopak.com or contact the APA on 02 8748 1555.